I agree with Terraformer that the energy requirements of Mars residents will be pretty high - certainly higher than 500 Watts per person. Mining, transport, agriculture and life support are going to be significant consumption factors. You have said pretty much the opposite in past discussions - that the energy requirements of a Martian settlement would be quite modest and we don't need heavy investment in this area. So which is it? Also, are you really going to have a community of 100,000 dependent on one energy source? If the energy source fails, you have a catastrophe on your hands. Won't you need back up - possibly a doubling of your tonnage immediately. Not really what I was saying. Maybe we will need a lot more than 500W, that was an example of how to meet a bare minimum. At 500W per person, 1 x 50MWe nuclear power source would meet the requirements of 100,000 people. But in a city of 1 million there would be 10. So there is never really an issue with redundancy. Having more redundancy would mean having more power. If it takes 1 reactor to meet life support and subsistence requirements of a base, then the second is unlikely to sit idle. It would be used to support ore processing, exploration, manufacturing and exploration. In the event of failure, these operations could be scaled back until repairs are made. You're are probably misinterpreting my comments on different scenarios. I would say for Mission One the energy requirement could be modest: the reason being that you don't need on Mission One to build your industrial infrastructure to a significant degree. It would be more about surveying, prospecting and conducting experiments. I doubt we would be doing much agriculture on Mission One either (maybe just a "salad bar" hydroponic facility). Of course, there is the issue of propellant production. My own preferred approach from a few years back involved more an Apollo style ascent vehicle. Clearly, a Musk/Space X mission architecture requires a significant energy input to produce the propellant. Once the colony starts producing its own food and building its mining and industrial infrastructure I think it will need above average needs (particularly for indoor artificially-lit agriculture). However, on the other side of the equation, the colonists (on a per capita basis) will not require much if any energy for space heating, for running private cars, for going on holiday, for lawn mowing and for an array of manufactured goods (paper, furniture, pianos, bikes, carpets, curtains and so on). So it's a complex equation. My own view is that the Mars colony will be growing at a prodigious rate and so its per capita energy requirement for infrastructure (construction, life support, mining, industry, transport and indoor agriculture) will place it well above the US average energy use. On a daily cycle, energy requirements will fluctuate significantly as well. At night energy requirements could be v. minimal if you produce all your hot water for heating and hygiene during the day and confine most industrial actiivities to day time. Likewise in an emergency situation your energy production requirements could be brought down to a minimum. True, if you have a million people, but you appear to accept that for 100,000 people you would need two. I would certainly think it unlikely that the first million people on Mars would all be squeezed into one spot in any case. There would like be four or five major settlements and tens of smaller settlements. Each would require a flexible element of redundancy. Being about to build power once we have enough power to survive on is key to mars growth. Found another Do It yourselfer site for lots of things. where eagles fear to perch ... musings on simple living, gardening, personal finance plus my projects and experiments..
Well are there are any options apart from solar power (PV or solar reflective technology) and nuclear power? Methane capture perhaps (but you still need to isolate oxygen to get the burn). Lots of metals can also be burned with oxygen, so releasing energy. You might be able to create hydropower off the right glacier, using solar reflectors to melt the glacial ice and then feed it to a hydroelectric turbine system. That might work, but it's clearly not viable for an early mission. Windpower doesn't seem to offer much on Mars. Yes, I had forgotten about the potential of CO2 to vapourise and provide the equivalent of a steam engine...but I am a bit puzzled (no doubt partly because my understanding of the science is limited). I had always thought with say a coal-fired steam engine, you weren't getting any more energy out of the system when you turned water into steam, you were simply using energy to create a pressure phenomenon. The article makes it sounds like you are actually getting additional energy from CO2 sublimation itself...What is the science here? If we use x to heat the CO2 do we get x plus out of the system? Because I thought with steam engines you put in x and get x minus out as useful energy either to work a machine or power a generator. If the CO2 heat engine is also producing x minus, then although it might be useful, it isn't really providing additional energy. Geothermal may well yield useful results on Mars but I guess that is for a later development phase as the infrastructure requires a pretty big investment of labour and materials and drilling on Mars is probably harder than on Earth. NASA and the Department of Energy’s National Nuclear Security Administration (NNSA) have successfully demonstrated KiloPower, which is a new nuclear reactor power system that could enable long-duration crewed missions to the Moon, Mars and destinations beyond. NASA announced the results of the demonstration, called the Kilopower Reactor Using Stirling Technology (KRUSTY) experiment, during a news conference this week at the NASA Glenn Research Center in Cleveland. Kilopower is a small, lightweight fission power that uses passive liquid sodium for heat transfer to stirling engines which produce electrical power. The system as tested is capable of providing up to 10 kilowatts of electrical power – enough to run several average households – continuously for at least 10 years. Four Kilopower units would provide enough power to establish an outpost on the moon or Mars. The prototype power system uses a solid, cast uranium powered reactor core. 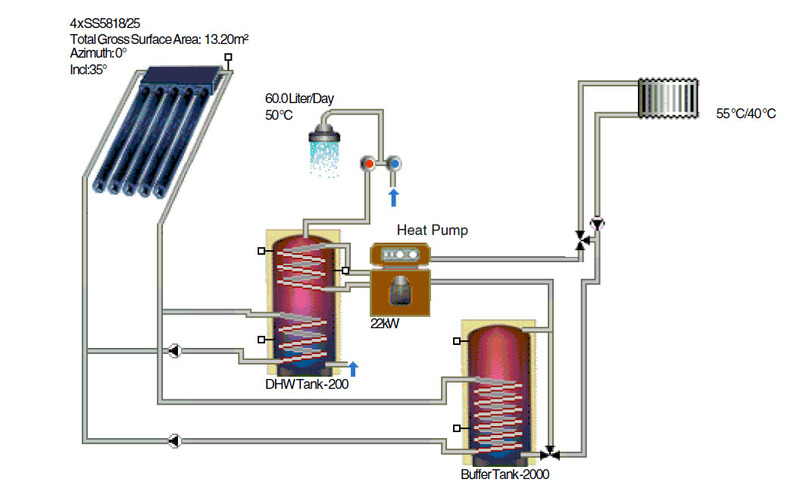 Passive sodium heat pipes transfer reactor heat to high-efficiency Stirling engines, which convert the heat to electricity. The key to successful deep space science missions, beyond the orbit of Mars, is to have enough electrical power to sustain the entire mission over many years powering the science instruments and the transmission of massive amounts of data back to earth. There is not enough sunlight beyond Mars orbit to meet these needs hence the need for nuclear fission powered electrical systems. NASA made that decision based on projected use of existing stocks of plutonium-238 for upcoming missions, such as the Mars 2020 rover. Dragonfly, one of the two finalists for the next New Frontiers medium-class planetary science mission, also plans to use a PU-238 radioisotope power system, as well as potential future missions the moon that require nuclear power to operate through the two-week lunar night. Still, the agency needed to balance mission demands against existing inventory of plutonium and new efforts currently to produce new supplies of the isotope, which should reach a goal of 1.5 kilograms a year by around 2022. I think once Space X have demonstrated a successful PV powered mission, that will be the end of the nuclear power hocus-pocus as far as human missions go. This may be useful for robot missions to the outer solar system. Solar on its own will not cut it as the planet is only just so large and the amount of energy per meter is not what we would want it to be for man to have an earth condition under a dome with a just like earth conditions is just not going to happen. The panels will reach an upward limit in time and that still will be by covering every in of mars with panels, ao no light under the dome for man to see or feel. To put mars in perpective take a panel on earth and cover half to start with just the change in distance. Then we would cover some more of what is not covered in order to simulate the dust in the atmosphere blocking the suns rays that reach the surface. Now try and power the eqiupment with what it will put out even here on earth as thats what we will have on mars from that same square meter of solar cells. Battery information starts on page 16 of course the voltage converter for charging will have some loss but no more that what we have on earth but we will need to expend energy to keep a battery warm on mars that we do not need to do here on earth. electrostatic discharge. This will have to be taken care of in a design. As I recall the energy input is about 40% compared with Earth but for most of the time it's far more consistent given the lack of cloud cover. Also, because of the way the planet oscillates, solar radiation is more evenly spread out between 0 and 30 degrees. Space X are clearly committed to solar power. I just don't see what the issue is...the first mission can be solar powered. I could only ever see a case for nuclear power in the first couple of missions but given the huge cargo tonnage that Space X are planning I think that is now irrelevant. Solar it is. I would expect the Space X Mars mission to have a mix of PV panels but would certainly include some arrays around the 30% mark for immediate deployment, in similar fashion to the Orbital ATK fan method. Their output would be getting close to those of standard domestic panels on a clear day on Earth, assuming no dust storms. Can waste heat from power generation be used to support manufacturing on Mars because average outdoor temperature on Mars is about -60C? A heat engine make use of that difference between waste heat concentrated by a working fluid and the outdoor temperature can turn the thermal energy to either electrical and mechanical. So on paper, factories are located beside the power stations and make use of the electricity from the grid, that and mechanical energy from the waste thermal energy. What is left in waste thermal energy is stored in thermal energy storage or grid energy storage until enough is concentrated and exploited for factories, manufacturing and agriculture. Most technologies associated with the ideas above are available, including heat engines of Stirling and thermoelectric generator, combined heat and power, combined cycle power plant, thermal energy storage and grid energy storage, and hybrid locomotive of electricity from battery and/or the grid and thermal energy from nuclear and geothermal energy. You can take advantage of the temperature differential to power a CO2 vapour engine - turning solid CO2 into vapour, as we do with water in steam boilers on Earth. I think that may be more promising than heat engines as such. There are low temperature or waste heat designs being made but what would be the output levels for what we could get for mars? Cyclone Power Technologies operates at temperatures as low as 225F (107 C). The engine can generate up to 10kw from heat sources such as industrial ovens or furnaces, concentrating solar thermal collectors, engine exhaust and biomass combustion. The compact, lightweight 18 lb (8 kg) Waste Heat Engine is a six-cylinder radial steam engine capable of running on waste heat as low as 225 °F (107 °C) and pressure as low as 25 psi (172 kPa). The engine achieves maximum efficiencies at 600 °F (316 °C) and steam pressure of 200 psi (1.4 MPa), at which point one Waste Heat Engine can generate 16 hp (12 kW), 30 lb-ft (41 Nm) of torque, and a little over 10 kW of electrical output. The only drawback is the typically low 12% energy efficiency common with most reciprocating steam engines. On the plus side the piston-based steam engine operates at a maximum of 3000 rpm which means it is well suited to drive any standard generator. The tricky bit is not keeping the atmosphere but making it (and making it within a reasonable timeframe which I put at say 200 years) - since we are talking about trillions of tonnes of material. My following ideas have likely been expressed on this forum. Considering carbon dioxide and monoxide have negative enthalpies of formation and the intense heat on Venus (462 oC surface temperature), that heat can be used for converting carbon dioxide into graphite and oxygen; both of which will be shipped out from Venus to Mars. On Mars, they on paper can be burnt to recreate the carbon dioxide and yield electricity. However, any energy conversion is not 100% so I believe both graphite and oxygen are useful themselves on Mars. For example with future technology, can graphite could be converted into carbon nanotube for electrical wires? Better yet like how plastic are manufactured, carbon dioxide on Venus is converted into particles of carbon nanotube and oxygen. Then after shipment onto Mars, the nanotube particles are molded into electrical wires. Out of curiosity, how feasible would a rechargeable battery be on sodium or lithium ferrate cathode and metal hydride anode? Better yet on magnesium iron hexahydride anode. After discharge, both iron species become iron on oxidation state +3. Such battery is used for energy storage for the electricity grid of a settlement. The alkaline electrolyte that stabilizes both electrodes means taking up more oxygen than the sulfuric acid in lead acid battery. Occurrence of carbon dioxide, water, metal oxides and perchlorates means using local sourced, oxygen based material in the battery is helping drive the cost down. Lastly, Vanadium redox battery is used on Earth for grid storage. Can a modification operating on iron be made? Putting in perspectives, the Vanadium redox battery operates on vanadium cations. How about a sulfur redox battery on sulfur or chlorine oxoanions? Emissions-free energy system saves heat from the summer sun for winter. A research group from Chalmers University of Technology, Sweden, has made great strides toward the development of a specially designed molecule which can store solar energy for later use. These advances have been presented in four scientific articles, the most recent appearing in Energy & Environmental Science. Around a year ago, the research team presented a molecule that was capable of storing solar energy. The molecule, made from carbon, hydrogen and nitrogen, has the unique property that when it is hit by sunlight, it is transformed into an energy-rich isomer—a molecule consisting of the same atoms, but bound together in a different way. This isomer can then be stored for use when that energy is later needed—for example, at night or in winter. It is in a liquid form and is adapted for use in a solar energy system, which the researchers call the Molecular Solar Thermal Energy Storage (MOST) system. In the last year, the researchers have made great advances in the development of MOST. The research group developed a catalyst for controlling the release of the stored energy. The catalyst acts as a filter, through which the liquid flows, creating a reaction that warms the liquid by 63 degrees Celsius. If the liquid has a temperature of 20 degrees C when pumped through the filter, it comes out the other side at 83 degrees C. At the same time, it returns the molecule to its original form, so that it can be then reused in the warming system. "The energy in this isomer can now be stored for up to 18 years. And when we extract the energy and use it, we get a warmth increase greater than we dared hope for," says the leader of the research team, Kasper Moth-Poulsen, professor at the Department of Chemistry and Chemical Engineering. During the same period, the researchers also learned to improve the design of the molecule to increase its storage abilities so that the isomer can store energy for up to 18 years. This was a crucial improvement, as the focus of the project is primarily chemical energy storage. Furthermore, the system was previously reliant on the use of the flammable chemical toluene. But now, the researchers have found a way to remove the potentially dangerous toluene and instead use just the energy-storing molecule. These advances mean that the MOST system now works in a circular manner. First, the liquid captures energy from sunlight, in a solar thermal collector on the roof of a building. Then it is stored at room temperature, leading to minimal energy loss. When the energy is needed, it can be drawn through the catalyst so that the liquid heats up. It is envisioned that this warmth can then be utilised in domestic heating systems, after which the liquid can be sent back up to the roof to collect more energy—all completely free of emissions, and without damaging the molecule. "We have made many crucial advances recently, and today, we have an emissions-free energy system that works all year around," says Kasper Moth-Poulsen. The solar thermal collector is a concave reflector with a pipe in the centre. It tracks the sun's path across the sky and works in the same way as a satellite dish, focusing the sun's rays at the point where the liquid leads through the pipe. It is even possible to add on an additional pipe with normal water to combine the system with conventional water heating. The next steps for the researchers are to combine everything into a coherent system. "There is a lot left to do. We have just got the system to work. Now we need to ensure everything is optimally designed," says Kasper Moth-Poulsen. The group is satisfied with the storage capabilities, but more energy could be extracted, Kasper believes. He hopes that the research group will shortly achieve a temperature increase of at least 110 degrees Celsius and thinks the technology could be in commercial use within 10 years. As always I cannot display a image file anymore. Maybe someone could help. I often view things on www.phys.org when I am having lunch. Sometimes something interesting shows up. 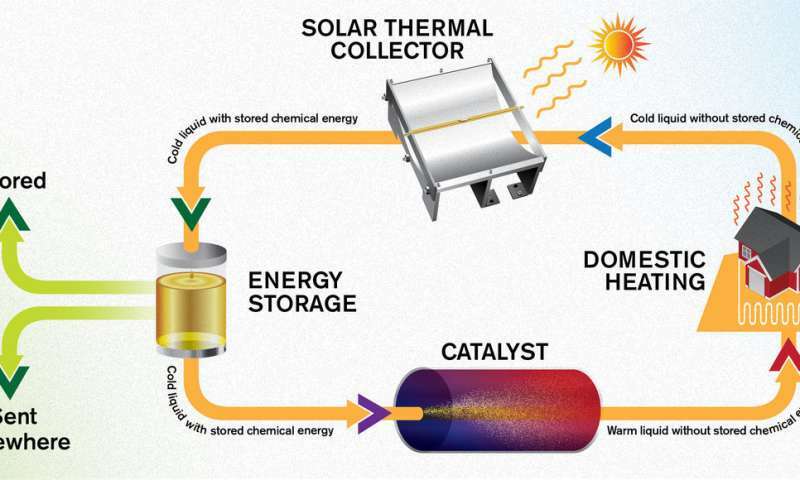 A method to chemically store thermal energy very long term. Quite suitable for mid and high latitude locations on Earth, Mars, and some other planets/moons I would think. Actually may be suitable for cold polar deserts on Mars, at high latitudes. Of course I have often mentioned ice covered bodies of water, and had hoped to store thermal energy in them. That can still be done, but I believe that at least for cold fresh water bodies, containers of plastic should be stable in the water. Don't know how the stored chemical would react to plastic containers however. However uninviting cold fresh water is to swim in, layering could make the bottoms of these bodies of water habitable. Also underground habitats under the lake/sea floors should be for consideration. Unlike Sweden which has the two problems of seasonality of sunlight, and cloudy weather, Mars would instead have seasonality of sunlight in many locations where water exists in quantity, and the problem of dust storms, and the problem/opportunity of deep night cold temperatures. So this system could be even more adaptive to Mars than to Sweden. Particularly the cold nights, or when dust storms are active. You might be able to go from 110 degC (A hoped future) to the night cold by using turbines with some fluid suitable to generate electricity. And of course you would have heating for your habitats as well. Not saying it is ready for prime time, but it is worth the trouble to watch I think. And of course as you know, the lake/sea waters could support a chemical driven biosphere. The method could be used first at the lowest latitudes where enough water ice was to be found, and could roll all the way up to the center of the polar ice caps over time. By the time it got to the polar cap centers I would anticipate that the atmosphere would have increased pressure sufficiently that cold ice would be stable over much of Mars. It is relatively stable at the caps now. Maybe ice covered or maybe even open water in places. Of course it would depend on the magnitude of atmospheric terraforming that had occurred, and perhaps mirrors in orbit. of the permafrost under the lakes/seas. If there were clathrates in the permafrost melted, they would be released. Perhaps a source for a biosphere driven by chemistry. What if Methane and Perchlorates were released? That could drive a biosphere. Wow Void - this looks like a real game changer. And yes, on Mars cost isn't a key consideration in the early colony so it could have huge significance for development of the Mars infrastructure. This is called "BBCode". BBCode is a very simple kind of "markup language" (html is also considered a markup language) that is used on forums. BBCode stands for "Bulletin Board Code". If there's something you'd like to do with it you can either google search "[thing you want to do] bbcode", check the forum's help page (just below where you enter your posts, click on the link that says "BBCode: on" to go to the help page), or ask me or someone else. You can also see how someone did something by quoting their post and looking at what comes up in the quote. As everyone has probably noticed I'm quite fond of the "list" function. What percent of absorbed solar energy is converted into stored chemical potential energy? A 63 degree Celsius temperature increase sounds like a lot but is actually not a very high temperature as far as energy generation is concerned. Most electrical plants on Earth operate in the 300-600 C range vs. 80 C for this system. (For thermodynamic reasons you're actually better off operating between the -40 C Martian ambient and +20 C but still not, like, very well off). How hard is this chemical to make, handle, and store? Molten salts can store heat quite well, and at higher temperatures, for as long as you can hold in heat, and this is the appropriate comparison technology imo.